Professional Jigsaw. Now, you might be forgiven for thinking there were enough variants in the Blue Tools range but this model brings the corded line up to just four with both scroll grip and enclosed grip GST 150 machines above this one. It's followed by the GST 135 BCE 'precision' model, while in other markets there is also apparently a scroll grip version of the GST 90 but it's not currently available in the UK. When you analyse what this latest model actually has on board it's very much the standard site jigsaw we've all used over the years with a 650-watt motor. Indeed its spec is identical to the previous GST 75 BE which it apparently supersedes. One could cynically suggest that the latest model is a re-casing exercise, but hopefully not, as Bosch are always seeking to improve their products. The GST 90 BE follows the current Bosch trend for increased areas of moulded plastic which research revealed to me as Polyamide 6 with glass fibre reinforcement. This is Greek to many but is recognised as an incredibly tough, stable compound for the engineering of power tool casings. At the same time Bosch have reduced the amount of visible aluminium casting that normally holds all the mechanical vitals together. The rubber overmould is discrete and barely proud of the surrounding plastics. A large sprung switch and ambidextrous lock-on button makes operation easy, with a rather stiff four-position orbit switch on one side, along with a blower-enabling slide switch. At the front there's the usual formed wire blade guard and a rather loose pullout blade change lever, now common on all fast blade change jigsaws. What is different is how easy it is to operate and swap blades but with very tight clamping jaws, which bodes well for cut accuracy, something jigsaws aren't too well known for. The blade roller has parallel inside faces with room for blade play but quite a deep slot, which should help blade guidance. The black finished, pressed steel soleplate is bend-resistant according to Bosch and appears very flat and smooth although no plastic overshoe is provided should you be concerned about surface protection. 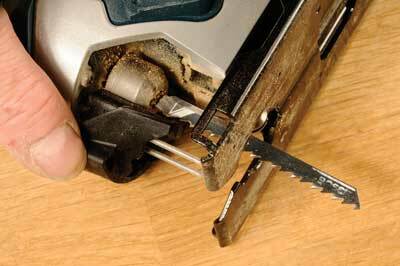 The dust spout comes firmly fixed in place and some effort is required to release it so that you can access the Allen bolt that locks the soleplate angle. There are detents for setting 0 and 45º both ways. 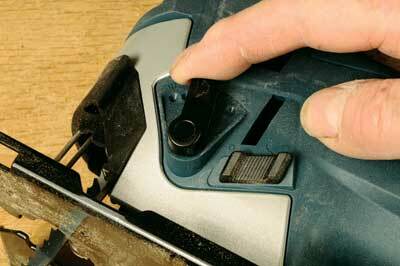 Flush cutting is just about possible if you set the soleplate back slightly and put the blade on full orbit action. the machine moved forward, certainly could be better. 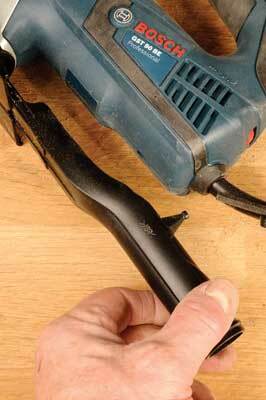 The blower action does just that, but the sawdust is shot forward, not collected of course. 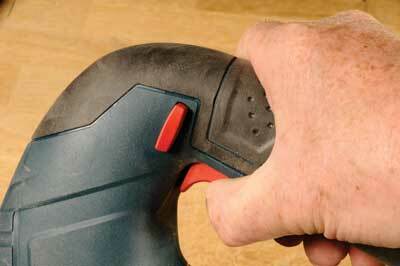 This is a good, well-built professional tool that should prove reliable, backed up by the Bosch brand name.